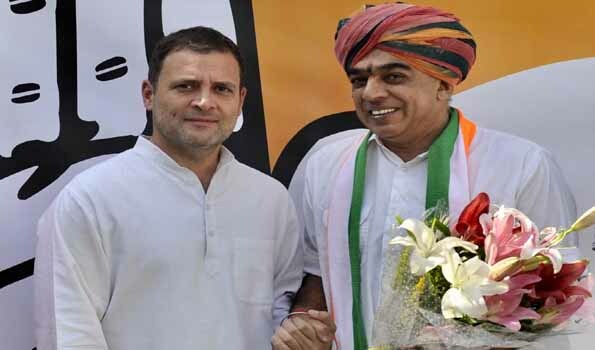 New Delhi: Ahead of the December 7 Rajasthan hustings, veteran Bharatiya Janata Party leader Jaswant Singh's son Manvendra on Wednesday joined the Indian National Congress. Mr Manvendra Singh, along with AICC general secretary former state chief minister Ashok Gehlot, PCC president Sachin Pilot and party general secretary Avinash Pandey, met Congress chief Rahul Gandhi at his residence here. ''I met Mr Gandhi today and he and other leaders welcomed me into the Congress party. I have confidence that my supporters, Swabhiman Sena, will continue to support me. Our support will create a historic impact in the assembly and next year's Lok Sabha polls,'' Mr Manvendra Singh told a news conference at the AICC headquarters. Mr Manvendra Singh, a sitting MLA, won the Sheo assembly seat in 2013 on a BJP ticket. In 2004, he was a Lok Sabha MP. His rift with the BJP leadership, especially Chief Minister Vasundhara Raje, began after the Assembly elections and escalated after Mr Jaswant Singh was denied a party ticket for the 2014 Lok Sabha polls. Reacting to the development, Mr Gehlot said everyone who believes in democracy and the Constitution knows that both are in threat today. ''Jaswant Singh was a Minister in the AB Vajpayee cabinet and held many important portfolios, including Defence and External Affairs. However, the current leadership denied him the ticket. We are welcoming Manvendra Singh into Congress,'' Mr Gehlot added.